Taunton City Hall is located at 15 Summer Street, Taunton MA 02780; phone: 508-821-1024. Photo: Dean-Barstow House, ca. 1870, National Register, 275 William Street, Taunton, MA 02780; photo by Marc n. Belanger, 2009, en.wikipediaorg, accessed April, 2012. The first Englishmen to visit this locality were Edward Winslow and Stephen Hopkins, in 1621, when they went to visit Massasoit. They found it desolated by the plague of 1612. At Tetiquett and Namasket there were Indian villages. The territory of Taunton, including Berkley and Raynham, was claimed by the Sachem of Tetiquett. The whole shore of the river had been thickly populated, and there were many unburied remains of those who had died in " the great sickness." Tradition says there were settlers here as early as 1626, but, if so, they were transient and solitary men, who held the lands by occupancy only. One of the first purchasers of Taunton was Henry Uxley, who came and went without leaving any account of himself. His house and lot were purchased by Richard Williams, one of the fathers of this town. He was a Welshman and a relation of Roger Williams. He was born in 1599; was a Deputy from Taunton to the General Court at Plymouth, in 1646, '48, '50, '51. The first meeting-house was built in 1647 on a calf pasture purchased for it. The second was commenced May 19, 1729. The third was built in 1789. The Spring-Street Society occupied it in 1852. Taunton formerly contained an area of eight miles square, and received, at the incorporation, A.D. 1640, the name. Rev. William Hooke, the first pastor of Taunton, born in 1601, a native of Southampton, England, remained in Taunton about seven years. Dr. Ezra Deane was the first physician who practiced in Taunton. He was the eldest son of Ezra, the second son of Water Deane. His mother was a daughter of Deacon Samuel Edson, of Bridgewater. It is generally supposed he was the father of the family remarkable for its longevity, in the history of the Deanes, eleven of his children living more than a thousand years. One of his daughters, Theodora, who lived to be more than a hundred, was the mother of Dr. Job Godfrey, one of the most eminent physicians of the town in the last century. Dr. Deane died July 1st, 1737. 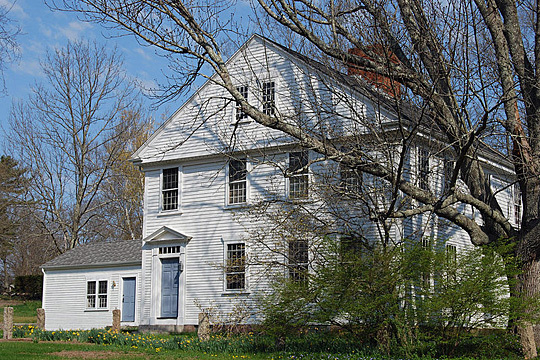 The first apothecary shop ever opened in Taunton was Mr. Daniel Brewer's, who came from Danbury, Connecticut, in 1785; he was once a minister, but subsequently embraced the views of Robert Sandeman. Hon. Samuel White was probably the first lawyer residing in Taunton. He was a native of Braintree, graduated at Harvard in 1731, and about 1745 commenced the practice of the law in this town. He was born in 1710, and died March 20, 1769, aged 59. He had the honor of presiding over the House of Representatives during the period of the Stamp Act. It was a circular signed by him as speaker of the House, which called together the first Congress that assembled at New York [Albany] in October 1765. The house he built and occupied is yet standing, called the Bowen house, on the old road to the Weir. The situation of Taunton prevented it from growing for some time, as none but the brave dared to settle so far inland among the Indians. About this time Elizabeth Pool, a wealthy lady of Taunton, in England, who had first settled at Dorchester, Massachusetts, undertook to establish a colony at Cohannet. All the territory around was inhabited by Indian tribes. Yet Miss Pool prosecuted her design with a fearless spirit stimulated thereto by religious enthusiasm, and her efforts were crowned with success. She died in 1654, and her kinsmen and legatees placed a monument over her grave with an inscription which commemorates her many virtues. She was a lover of justice as well as piety, and ever displayed a kind and charitable disposition toward the heathen tribes with whom she came in contact. She seems to have been among the first to admit the Indians' right to the soil, and she purchased her lands by giving a fair price before occupying them. The plantation of Cohannet was incorporated by the name of Taunton on the third of March, 1639. Among the ancient purchasers of territory of Taunton were Rev. Francis Doty, or Doughty, Henry Uxley, Joseph Wilson, Benjamin Wilson, William Coy, George Hall, George Macy. The Pools and most of the purchasers besides the above-named came from Dorchester, Mass. But Mr. John Brown came from Plymouth. In a work called "Plain Dealing, or News from New England," written by Thomas Lechford, in 1641, it is stated that Mr. William Hooke and Mr. Nicholas Street were both residents of Taunton at the same time, one as pastor and the other as teacher. They both seem to have come with Elizabeth Pool and her brother William Pool. Mr. Street had married her sister. Of the eighty purchasers of the tract of land, bought of the Indians, was Richard Williams, of Taunton. He married Frances Dighton, sister of Catharine Dighton, who was, after his death, married to Governor Thomas Dudley of Roxbury, and became the mother of Governor Joseph Dudley. Mr. Williams has many descendants in Taunton, as well as other parts of the country. Baylies, the Plymouth historian, believes Mr. Williams to have been related to Oliver Cromwell. He represented Taunton in the Plymouth Colonial Court several years, and seems to have been the Patriarch of the plantation at Cohannet. It has also been conjectured that he was a brother to Roger Williams, of Providence, the father of Rhode Island. John Strong, son of Richard Strong of Taunton, Eng., came to New England with his sister Eleanor, in the "Mary and John," in 1630. The sister married Walter Dean. They came from Dorchester, Massachusetts, to Taunton at its settlement in 1637. After the Indian War, Mr. Strong removed to Northampton, and became the progenitor of many illustrious families bearing his name in various parts of the country. His lot in Taunton was on Dean Street, adjoining those of John and Walter Dean. These two brothers by the name of Dean took up their farms on the west bank of the larger river, about a mile from the centre of the present village in what has ever since been called " Dean Street." John Dean's wife's name was Alice, and their son John is said to have been the first white child born in Taunton. This son John, born about 1639, died during the "Great Snow," Feb. 18, 1717. His gravestone is yet to be seen at the "Neck of Land Burial-place," which is the oldest in town. His posterity are numerous in Taunton and vicinity. The Bristol County Directory and History for 1870, D. Dudley & Company, Boston, 1870.